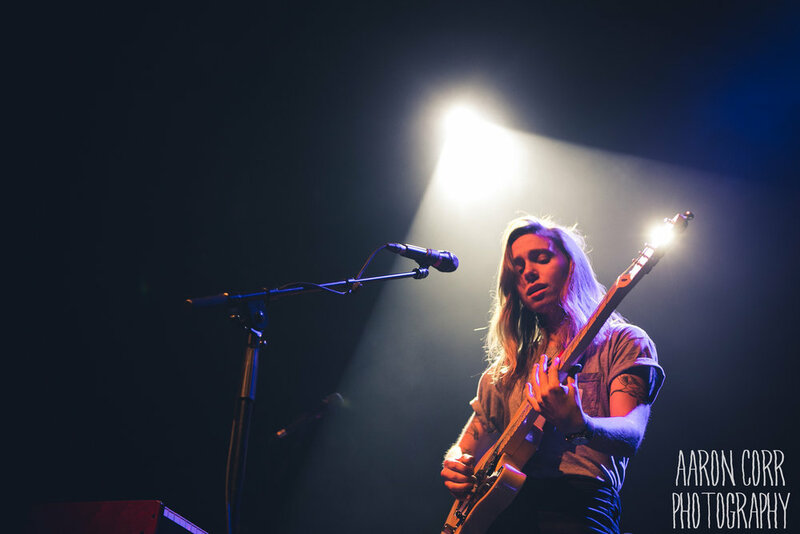 GoldenPlec sent me to shoot the Julien Baker show in Vicar Street. They had featured her quite a bit in advance, with an interview on the site ahead of the show. I didn’t manage to listen to her much but I came out captivated by her songs, her voice and her power on stage. Support came from Nashville’s Becca Mancari. She was to be with another guitarist but had to go solo due to a Ryanair issue. She was funny and charming on stage, and the lights were perfect for capturing her performing. There’s not much I can say about Julien Baker’s performance that hasn’t been said in the GoldenPlec review. What I can say was that, much like the support, the lighting conditions were excellent and the spotlights in particular adding to the effect. So much so I made sure to take more wider shots to incorporate them highlighting her on stage. The only distraction was the keyboard set up which got in the way when shooting from the left side. Not a big deal in the overall scale of things. It was a amazing performance by an artist I look forward to hearing a lot more from. Click any photo or here for full gallery.